"Though you might consider it an old school tradition of days gone by, having a receiving line is a sophisticated gesture that gives you an opportunity to thank your guests for sharing your special day.".. In decades gone by, it was traditional for every wedding reception to have a receiving line. Though many couples have decided to go away from having a receiving line in recent years, it's definitely something that you should consider. 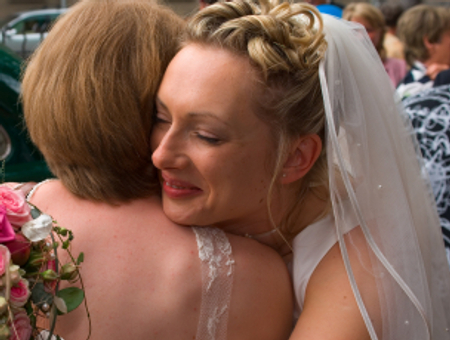 A receiving line allows the bride and groom to have an opportunity to greet each of their guests personally. Though it's perfectly acceptable not to have a receiving line, it can add a classy touch to your reception that your guests will appreciate. So, who is in the receiving line? Set up the receiving line inside the reception area somewhere near the entrance. Moving through the line shouldn't be a long, drawn out process. Instead, the guests should speak briefly to each person, shaking hands (or hugging) and offering their well wishes. It's not a time for a lot of chit chat and standing around. 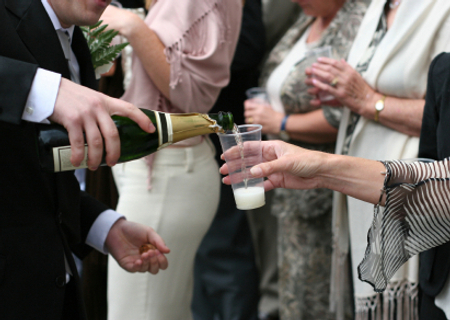 If you have a large number of guests, have the waitstaff pass drinks and hors d'oeuvres to those who are waiting in line. The talk should be relatively brief, such as: "Thanks for coming, Mrs. Thompson. It's great to see you again." or "Nice to meet you, Mrs. Thompson. I'm glad you could make it." Oftentimes couples want to include their fathers or other men in the receiving line. Though this is not the norm, it has become accepted in the past few years. To include men, the line still begins with the mother of the bride first, then the groom's father. Next is the groom's mother and the bride's father, followed by the bride and groom. Next would be the maid of honor, followed by the bridesmaids, best man and then groomsmen. Though you might consider it an old school tradition of days gone by, having a receiving line is a sophisticated gesture that gives you an opportunity to thank your guests for sharing your special day.